According to reports reaching us at jmedia.com.ng A 32-year old man identified as Austine Ibe has been sentenced to two-year imprisonment by an Oredo Magistrate Court for stealing 75 cartons of tin tomatoes valued at N315,600. Ibe was said to have committed the offence on October 14, 2017, at No. 4 Butcher Street, off Forestry Road, Benin City, Edo State . The items were stored in a warehouse belonging to one Paul Okafor. Ibe was arraigned on a two-count charge of stealing and break-in and entry, The Nation reported. He was found guilty on guilty on both charges by the presiding Magistrate, F.E Akhere. Prosecuting Council, Patrick Agbonifo, had earlier informed the court that the offences were punishable under sections 414(1) and 390(9) of the Criminal Code 48 Vol II Laws of the defunct Bendel State of Nigeria, 1976 now applicable in Edo State. Magistrate Akhere sentenced the accused to two years imprisonment without an option of fine. 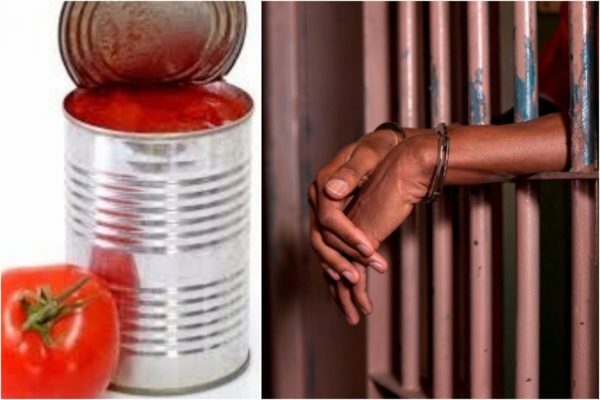 In another development that was reported earlier, A -19 -year -old man, Ogunlusi Abass, was sentenced to 6 months imprisonment by an Osogbo Magistrates’ court in Osun State for stealing dry fish and seven pieces of noodles, with a tin of three crown milk. The police prosecutor, Inspector Fagboyinbo Abiodun, told the court that Abass committed the offence on January 28, 2017. According to him, the stolen items belonged to one Rasheed Shakirat of Onibueja area of Osogbo. He said Abass also stole 3 beverages and 3 pieces of golden Penny semovita, valued at N4,630. He explained that the offence committed by Abass were contrary to and punishable under section 411 and section 390 of the Criminal Code Cap 34 Vol II. Laws of Osun State of Nigeria; 2002. The accused, however, pleaded guilty with deep remorse over his action. Meanwhile his counsel, Mrs A Y Dada haD earlier asked the magistrate to temper justice with mercy as the accused was remorseful. Chief Magistrate, Olusola Aluko, in his ruling thereafter sentenced Abass to six months imprisonment or a fine of N10,000.